What would become of humanity in the face of crippling invasion? How would we, as a species, survive? Would our survival instincts take over to where it became every man or woman for him or herself? Would we band together in an attempt to rise above all of that and try to survive together? 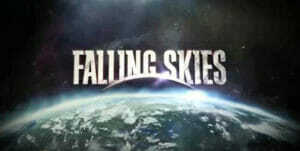 Welcome to my thoughts on the TNT series Falling Skies. When this series begins it’s 6 months after a race from another planet invaded, devastated, and wiped out 90% of the Earth’s population. Some that are left become a slave labor force as they are controlled by an alien tech known only as a “harness.” The rest of humanity is in hiding. Some become outlaws where it’s only about survival at all costs, while the rest form resistance and freedom fighter groups. Here we meet Tom Mason, a former history teacher (who really knows his history) who is second-in-command of the 2nd Massachusetts Militia Regiment in Boston. He’s a widower having lost his wife sometime after the first wave of attacks. He also has three sons, his oldest son Hal, middle son Ben, and his youngest named Matt. Hal and Ben are still with him, but Ben was captured and is now harnessed and doing slave labor for the aliens. The alien force is made up of bi-pedal machines called “mechs,” and 6-legged aliens called “Skitters.” Not much else is known about the alien forces, although one of the surviving humans, a biologist named “Uncle Scott,” has a theory about them, which through the first three episodes is not expounded on. There are hundreds of civilians serving in a variety of roles, including doctors, cooks, even seamstresses, for the ragtag militia-fighting group. During a reconnaissance mission Hal finds his younger brother, Ben, is still very much alive. He’s still harnessed and doing slave labor, but alive and otherwise well. Before Tom can attempt a rescue he’s ordered by his CO (Captain Dan Weaver) to check out an armory. It may be a trap set by the Skitters, but if it isn’t there could be a cache of weapons that the 2nd Massachusetts may be able to use. Instead he finds himself taken captive by some outlaws led by a man named Pope. After turning the tables on him Pope finds himself reluctantly integrated into the militia group and the objective is set on rescuing Ben, as well as many of the other surviving children who are being held captive, especially since a new medical procedure appears to have surfaced that will allow for anyone who is harnessed to possibly be freed of the harness, which up to now has always proved fatal. At the same time Tom comes in contact with a sole Skitter, and following the advice of Pope while being held captive, severely incapacitates the alien and brings it in as a prisoner of war. I despise post-apocalyptic stories, but this is a different scenario. I have no love for tales where humanity brings the apocalypse upon itself, but here we have an outside alien force that brings humanity to more than just its knees. Over 90% of all humans have been exterminated, leaving the remaining number of humans, however small that number is, to try to fight back and reclaim their world. I’m also no fan of stories that throw you into the mix of the situation from the start. Normally a show that starts 6 months after an invasion would be an immediate turn-off, but through small bits of exposition, most of which is told through children’s art work, brings the viewer up to speed in probably the most chilling way possible, especially when the voiceover of one of them is crying. Then there are the people itself. We constantly look in the news of today and try to find something noble about us amidst depressing stories of how badly we treat one another through crime, violence, and sometimes just social and political oppression. We keep hoping that maybe there is that spark of goodness in us that says we do deserve to live as a species in this Universe. 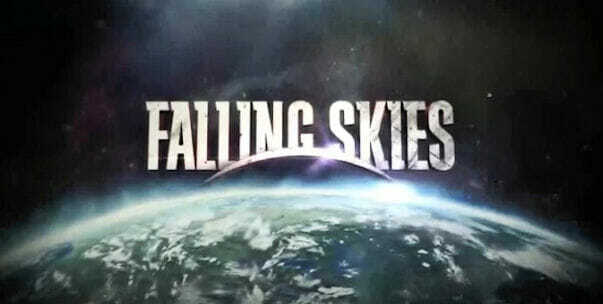 With Falling Skies we start to see that. There is still the emotional strife that exists with people as individual and group agendas collide, but they all somehow see the bigger pictures, and that is the need to survive and fight back. The methods may differ between Captain Weaver and Tom, but they still see the need to persevere and try to rid themselves of their alien oppressors. The production values in this show are top of the line. While there are scenes that take place in what appear to be nice neighborhoods (I had initially questioned why people weren’t hiding out in those houses, but that got answered by the show in relatively short time. ), there are also scenes of city streets in Boston that look like war zones. Even the characters look like they have been through hell. With tattered and dirty clothing, messed up hair and unwashed faces, we are seeing people who are literally fighting for their lives without virtually any amenities that we take for granted. While other shows and movies like to put what I call the “Hollywood Sheen” to make everyone look pretty, this show goes for the gritty, which gives the series a sense of honesty about it. As Keith and I were watching this we immediately commented on the believability of what we were seeing. It terrifies me to think what would happen to us if such an invasion occurred, but I would have to believe that it would look something like Falling Skies. The cast is incredibly strong here. While not made up of “A-listers,” this show does have a cast of more than competent and strong actors. Leading up the show, as Tom Mason, is Noah Wyle. Prior to this he had cut his teeth on ER, as well as a few other guest starring roles in TV and film. Here he gets to show what type of leader he is, not just as the character Tom, but also as the starring actor of this series. He gives us a well thought out character, who in turn is extremely thoughtful in all of his actions, is extremely passionate about his family, and despite what Captain Weaver might think, can also be a man of action when called upon. Captain Weaver, as played by Will Patton, initially comes off as almost a stereotypical jarhead, but Patton seriously underplays some of the nuances to Weaver’s character, which range from remarkably touching, to even sometimes humorous. Tom’s oldest son, Hal (Drew Roy), is possibly the one contradiction in this mix. Just from looking at him he comes off as “the pretty boy.” Drew is a damned good looking young man, which unfortunately takes away “some” of the believability for this show. He’s too good looking. Most of the time he looks pretty freshly scrubbed and shaved, and his hair is way to coiffed for a story of this nature. However, what does help the character of Hal is that Drew is as equally a damned good actor. In one scene that was intended to parallel a prisoner situation from World War II, Hal is forced to witness the execution of some children (which thankfully the audience is spared from seeing), and then be returned as a sort of messenger regarding what the Skitters are capable of doing. It is Drew’s acting that helps to make that entire scene work. Just knowing that the children are executed is bad enough, but Drew’s role as an actor is to serve as the face of that burden. He even comes off as someone possibly suffering from a form of PTSD. With only three episodes in it is hard to say if there are any long lasting ramifications from that. What is certain is the conviction that Drew brings to the role, through the strength of his acting, was I able to overlook the fact that he appeared as too “Hollywood” for the part. Then there is Pope (Colin Cunningham). Having done sci-fi TV previously with Stargate SG-1 Colin gets to really play against that type as head of this gang of outlaws. From the first time we see him he is clearly unlikable. In fact he’s outright detestable, but by the third episode he starts to hint at being more than just some caricature. Pope clearly has his own self-interests at heart, but after his scenes played out in the third episode I began to suspect that he had much more to offer. Let me reiterate that I am only three episodes in to the series. Nonetheless, with character development like this I find that it has brought a sense of richness to these stories. 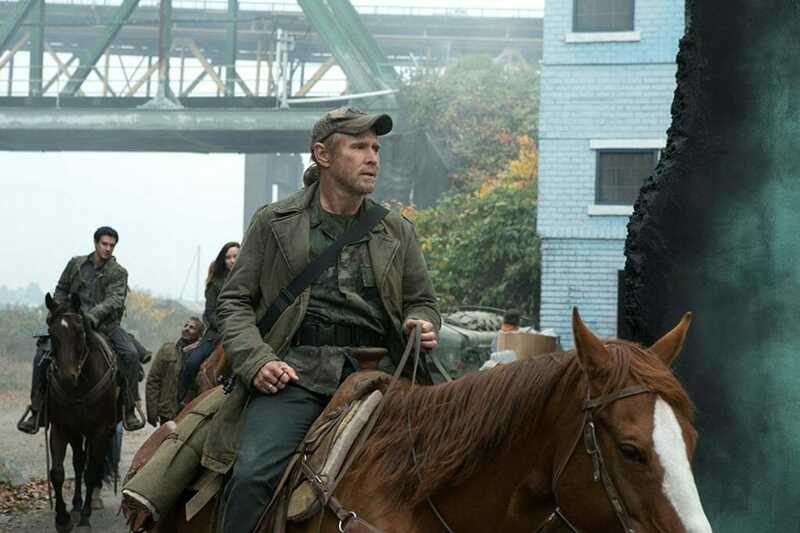 It would be easy to go extremely flat and predictable with a show like Falling Skies. Instead series creator Robert Rodat is giving us an honest portrayal of flawed people who are trying to rise above their own limitations and imperfections. We are given the opportunity to see their struggles and the horrific challenges they must endure in the face of such adversity. It is through that we see the nobility that is the human species. Through such struggles, with our nobility shining through, does this show become less about a dystopian world humanity has been thrust into, but instead becomes more about the strive to create a utopia, where humanity isn’t a divided species, separated by borders, politics, and perceived social norms, and is instead united as a single citizen race in this thing we call the Universe. Falling Skies may be a science fiction with aliens and robots, but to simply regard it as that would be a disservice to this show. Instead, after having only watched the first three episodes, I see it as a series of what humanity is truly capable of becoming. Isn’t that what science fiction is supposed to do? By placing a mirror in front of us, and allowing us to take a good look at ourselves, science fiction can ask us the question, “This is who you are. What do you want to be?” After watching three episodes, Falling Skies more than adequately asks those questions making this, for now, a truly worthwhile series to watch.